The Theatre Circuit’s Inch of Your Life: Episode 1 is what happens when you cross a sleek, made-for-tv dramedy with the passion and gusto of 8 expert stage actors. Inch of Your Life: Episode 1 runs like a one-hour TV episode. The scenes switch back and forth between the A, B and C stories with your classic “sitcom transition music” in between. It’s thrilling, innovative and one of the most unique presentations of theatre I’ve seen on a Canadian stage. The show gets off to a hot start. The pit band drummer hits a bangin’ beat while the cast, clothed in black and white, gather on stage to pose for a family photo. The best way I can describe the style of this show is “Arrested Development Live”–except instead of a dysfunctional Eastern-European family, it’s a dysfunctional Italian family, with each member having their own distinct characteristics and issues that set them apart. It has all the makings of a great primetime dramedy, but what really surprised me is how well this TV-to-stage concept worked! The cast as a whole is strong, however there are a few players who stood out to me. Giovanna Pandullo as Sylvia is a total handful in the best possible way; every word that came out of her mouth was dripping with sass. She’s the Italian-Canadian princess we were hoping to see. Luis Fernandes and Antonino Pruiti as Eddie and Gus, BFF mobster buddies, easily had the best scenes in the whole show. Both men had a fire in them, and when they were together on stage, sparks flew. I’ll also mention Jack Everett as Nick Catelli. He pulled off dead-beat, stay-at-home alcoholic-bro with flying colours and endearing humour. I don’t usually comment on pacing, but I feel like I have to in this case because it was so on point! Comedies sometimes fall into the trap of leaning on awkward humor or drawn out “bits” to get laughs, but Inch of Your Life: Episode 1 had a different approach. The show has this attitude of “bada boom bada bing, onto the next thing.” They weren’t stopping for anyone, almost like saying, “If you can’t keep up with our mile a minute Italian banter, then too bad.” They’re demanding our attention, and it totally works. The writing, too, is generally strong. Most of the scenes consist of two family members verbally duking out an issue, driving the over-arching plot forward. The story is well structured and has a natural flow to it. The dialogue also feels very natural to me, not overly jokey or clever which was a good thing. I thought the tone suited “overly-dramatic, loud Italian family” perfectly. Writer Massimo Pagliaroli has created funny, larger-than-life characters without turning them into caricatures of the Sopranos cast. They were layered in unexpected ways, like when Gus Lo Primo, the ultimate cool Italian guy, gets all testy and insecure when his friend tells him his girlfriend’s friend doesn’t like him because he eats with his mouth open. Lo Primo goes from tough guy to crying drama queen in seconds. Simply hilarious. I will mention that although many of the characters had these unexpected sides to them, the two female characters in the show, Sylvia Moratti and Jill Preston, didn’t get the same treatment as the men. This made the script seem a little bit dated. I felt that these ladies could have done more with each other than just talk about boys. Don’t get me wrong, talking about boys is great, but what else do these women care about? I wouldn’t have noticed this a few years ago, but nowadays, I can’t help but cringe slightly over these one-sided female characters. One other little thing I noticed was that some of the scenes ended with a bang whereas others would sort of fizzle out or end abruptly, which I could absolutely see working if it was on screen. Since this TV show is being played out on stage, though, the scenes could have used a bit more suspense in the end to get the audience thinking, “Uh, oh…what’s gonna happen next! ?” Just a tiny thing I noticed in this overall brilliant script. Aside from a couple blips, Inch of Your Life: Episode 1 is still, unbelievably thrilling. Upon leaving the theatre, my guest and I were already making plans to see episode two. We’re just dying to see what happens next in the lives of the Catellis. Inch of Your Life: Episode 1 is playing at the Theatre Passe Murielle (16 Ryerson Ave.) until March 17th, 2018. Shows run Wednesday to Saturday at 7:30pm, with one matinee at 2pm on Saturday, March 17th. Tickets are $25 ($20 for arts workers, $30 for willing-to-pay-more) and are available online or in person at the Theatre Passe Muraille box office before the show. 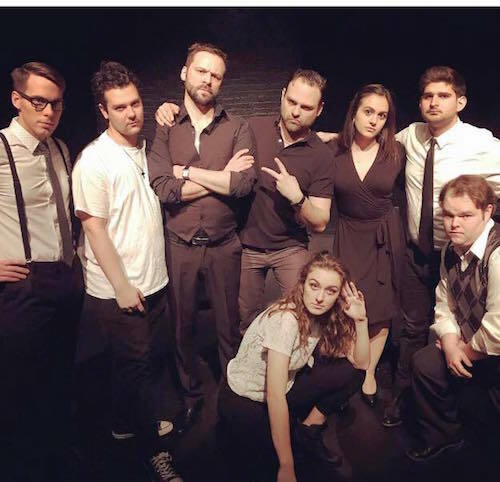 Photo of Alex Clay, Jack Everett, Luis Fernandes, Ceridwen Kingstone, Brandon Knox, Giovanna Pandullo, Antonino Pruiti and Jonathan Sconza provided by the company.